Most of these notes are fairly scarce. We generally see them sell for between $300 and $1,200. There is room for that price range to go higher. 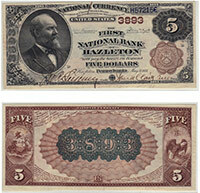 However, more valuable notes have to be in excellent condition or they need to be from rare banks. Please contact us if you would like to know the exact value of your note. Don't forget to check the serial number. Number 1 notes always sell for nice premiums.